When a customer buys or signs up for your product or service, you both want the same outcome - for them to be successful. Your customer has a problem, and you want to be the solution. But, how do you increase the chances of this happening? How do you help your customers discover you are the solution for them? The answer: customer education. While not exactly a revolutionary concept (it’s a practice that’s been around for years), how we educate our customers has changed dramatically. It’s fast becoming a must-do strategy for modern businesses. And it’s all thanks to emerging technologies, better access to resources, and increased awareness of its significance. For businesses looking to formalize, update, or begin their customer education program this guide is for you. We’re sharing the ins-and-outs of how to educate your customers so that you can improve their chances of success. Customer education is providing your customers with the tools and resources they need to be successful with your product or service. Its aim is to guide your customers through your product from their initial interaction to continued usage with the end goal being to increase adoption, reduce friction, and strengthen retention. Customer education doesn't just boil down to one or two small benefits. Its positive effects are numerous. They’re also intertwined, and when done well, it feeds a much bigger machine, helping to fuel your business's growth. It might be obvious, but the main gain is that it shows them how to best use your product or service. You are providing them with details of the features they should use, how to effectively use them, and best practice advice that shows you are the solution for them. How much of your support team's time is eaten up answering the same simple, arbitrary questions? We see this a lot as businesses are deep in support queries that waste time, money, and resources. Training solves this. You can provide the common answers for your customers with training, leaving your support team free to talk to your customers about more important issues and better serve them in the long-run. For a business, the key objective is to have happy customers. And that is what educating them does. Its most prolific benefit is that it gives them to the tools and support they need to be successful. This success means they are more likely to be satisfied with your business; they’ll buy more and stick around for longer. With customer satisfaction comes the spreading of positive word of mouth about your business - the ultimate marketing tool. You become a go-to business for your product/service and subject matter. Your happy, educated customers are more likely to reward you with a higher NPS rating, write glowing reviews, and recommend you to others, further nurturing your growth. Educating customers is a powerful way to scale and grow your business. Not only are more customers educated about your product, but you’re also doing it in an efficient way. Educated customers equals successful customers which, in turn, equals faster growth for your business. Every business has a customer training program be it formal or informal. Before you build it up or add to it, it's key that you dig into what's already happening to get a holistic view. So, what does an audit entail? What resources are we currently giving our customers? Do you give your customers any guides, allow them access to support docs, or even talk to them face-to-face? What about that email you send when they first come onboard? Remember, nothing is too small to count! What teams are involved in customer training? Customer support, sales, marketing - talk to these teams and ask what they are doing to educate customers. What tools are currently being used to educate customers? Do you have a learning management system and/or a customer support centre? Count every tool you have and identify the impact it has on customer success. It’s not enough to just track every little thing you’re doing now; well-rounded customer education program planning should also include what you’re not doing. Support records, common customer questions, requested guides, customer interviews; deep dive into all the information you gather to discover the full picture of your current processes. From your research, you’ll start to see patterns emerge, educational gaps in your customers’ journey that need to be filled or improved. Now it’s time to record all of these gaps. The list goes on… it’s your job to find as many of these as possible. Then, it’s time to develop a plan of action to fill these gaps. Now you know your customers’ pain points, you can develop your plan to help them overcome these. For this, you'll need the right tools and resources to help them do it. There's a wide variety of first-class tools available today that help businesses deliver efficient and effective training. 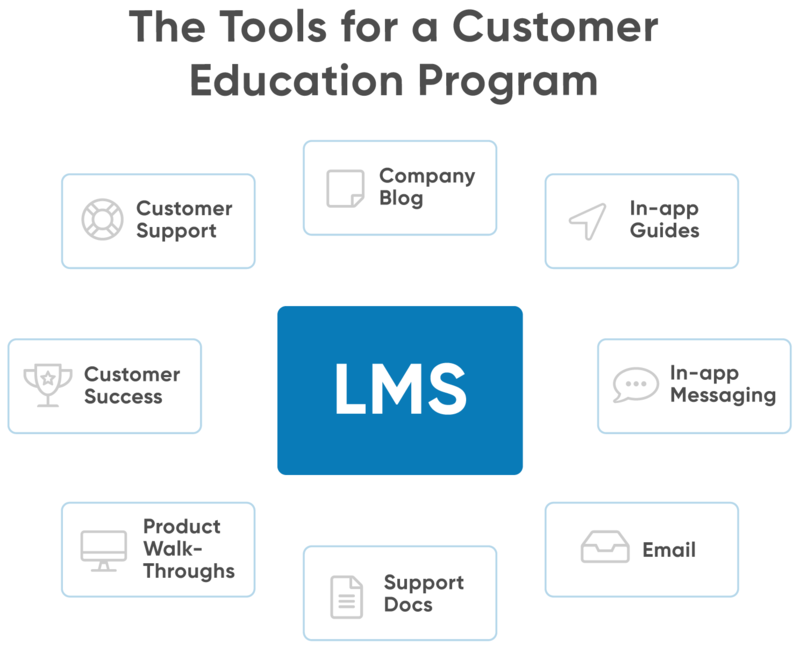 Centrally, a learning management system is key to manage, track, and achieve your learning goals, However, you can pick and choose between a few options to offer a wide variety of educational experiences for your customers. Not all these tools need to be used immediately. It’s also likely you have some already in action. Invest in the most pressing ones and work from there. With your tools identified, you can now create the training you will provide to your customers, and, importantly, decide when you will be providing it. We often hear from customers that this can seem overwhelming, but the key is to start where you believe it will impact most. For example, if you’re losing a substantial amount of customers in the first few weeks, develop a set of onboarding courses within your LMS that aims to tackle these problems first. Or if you’re overwhelmed by the same support query, develop support docs that answer the recurring question head-on. Develop resources that plug your biggest educational gaps first, and the rest can follow. Customer education isn’t a program you build, launch, and never touch again. Companies that thrive view it as a living, breathing part of their success that needs to be constantly tweaked, updated, and reevaluated. Using reports from your LMS, checking your support queries, hearing customer feedback, will enable you to add to, and constantly improve, your training so it has the maximum positive impact on your customer success.